Following a national search, PDP has been selected to prepare the National Historic Landmark Nomination for the General Motors Technical Center in Warren, Michigan. The GM Technical Center, designed by Eero Saarinen and completed in 1956, is an icon of mid-century modern architecture and planning. It contains 25 main buildings on over 600 acres, and is currently home to over 15,000 GM engineers and designers. The NHL Nomination project will be led by Dominique Hawkins and George C. Skarmeas, in collaboration with Emily T. Cooperman. The project is scheduled to commence in late 2011, and be completed in 2013. The City of Newton, Massachusetts - located just outside of Boston - has selected PDP to prepare Design Guidelines. Settled in 1630, Newton later became one of the nation's first commuter suburbs. Its four local historic districts contain a variety of significant historic properties, ranging from early mill buildings to Colonial Revival houses. The project is scheduled to be completed in June 2012. After a national search, the City of Fort Lauderdale has selected PDP to prepare Design Guidelines. With its origins as a 19th-century fortification, Fort Lauderdale has a rich architectural heritage preserved in three historic districts, 54 individually designated historic sites, and ten sites on the National Register of Historic Places. The project is scheduled to be completed in June 2012. 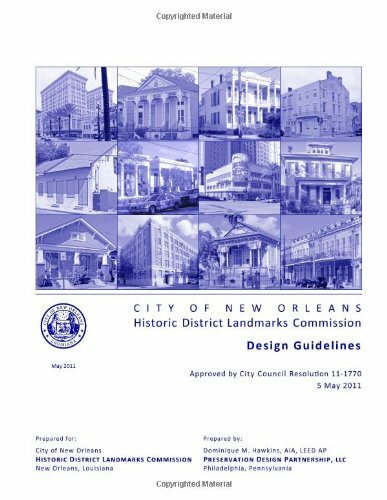 PDP's Design Guidelines for the City of New Orleans Historic District Landmarks Commission have been published through Amazon's Direct Publishing Program. The Guidelines will be available for purchase at www.amazon.com for approximately $30. PDP's Design Guidelines for the City of New Orleans Historic District Landmarks Commission have beenselected to receive an award from the Pennsylvania Council of the Society of American Registered Architects (SARA), in the Land Planning Projects Category. The award will be presented at the SARA Awards Banquet on Thursday, September 22, 2011 at the Knowlton Mansion in Philadelphia, PA. Following a national search, PDP has been selected to prepare Design Guidelines for the Village of Oak Park, Illinois. A suburb of Chicago, Oak Park is renowned for its collection of Frank Lloyd Wright buildings and its award-winning focus on preservation planning and sustainability. The Design Guidelines, which will be available to property owners in both electronic and printed form, are scheduled to be completed in early 2012. The New Orleans City Council has voted to unanimously approve the Design Guidelines for the City of New Orleans Historic District Landmarks Commission, prepared by PDP. The comprehensive Design Guidelines, prepared under the direction of Dominique M. Hawkins, address over 14,000 properties located within fourteen historic districts scattered throughout New Orleans. The guidelines are available to residents online at new.nola.gov/hdlc/design-guidelines. George C. Skarmeas served as a design juror for the Inform AIA Virginia Awards, and for the New Jersey Institute of Architects Awards. PDP has been selected to complete an Intensive-Level Survey for the City of Cape May, New Jersey. Cape May, widely recognized as the nation's oldest seaside resort, is a National Historic Landmark and represents one of the finest collections of Victorian architecture in the mid-Atlantic region. PDP's scope of work includes survey of 400 properties, as well as a study of the current historic district boundaries. George C. Skarmeas has been appointed to the U.S. National Commission for UNESCO. The Commission is a Federal Advisory Committee that supports worldwide humanitarian development by coordinating efforts and delivering expert advice from Federal, State and Local Governments and NGO's on issues of Education, Science, Communications and Culture.